University of California Rice On-line is an interdisciplinary team consisting of UC Cooperative Extension specialists, faculty and farm advisors dedicated to providing rice growers with up-to-date guidelines and information on rice production in California. 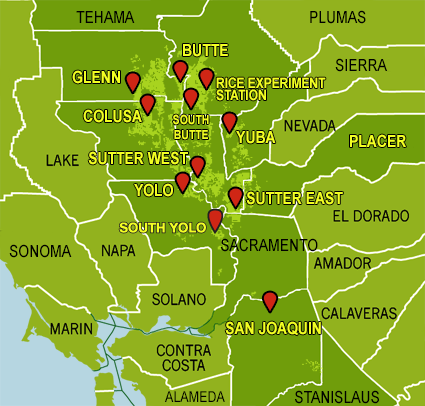 Rice growing area (lightest green) within California counties where rice is produced (darkest green). Rice variety yield trial locations are indicated (red pins). No scheduled meetings at the moment. The following Cooperative Extension county offices distribute periodic Newsletters that contain useful information, announcements and resources about rice (and other crops).